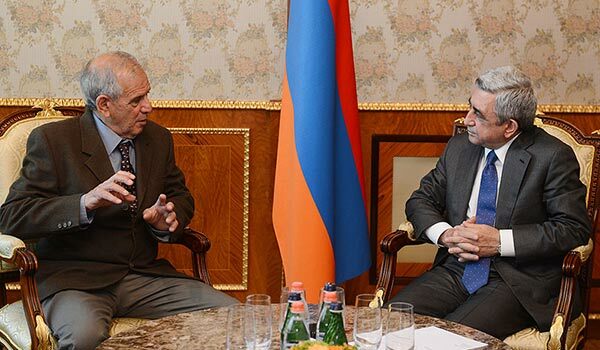 Today, President Serzh Sargsyan received Yair Auron, an Israeli historian and specialist in genocide studies. The Armenian version of his The Banality of Indifference book, which is based on the extensive research of the archive materials, has recently been presented in Yerevan. Present at the meeting was also the former member of the Knesset, former Minister of Immigrant Absorption Yair Tzaban. According to his press office, President Sargsyan extended his congratulations on the publication of the Armenian version of The Banality of Indifference and expressed gratitude to Auron for his invaluable work and exertion. The president of Armenia underscored that many of the Jewish intellectuals have been standing side by side with the Armenian nation, sharing the Armenians’ grief and tragedy, taking interest in our nation’s problems. Sargsyan noted that it would be hard to name one by one all those Jewish intellectuals who have spoken about the Armenian Genocide and said that the modern Israeli historian Yair Auron with his significant work is one of them. Auron reportedly thanked Sargsyan for his warm words and for the affection and appreciation showed to him by the Armenian public during the days of his visit. He said that all this gives him a new impetus to carry on with his struggle. The Israeli historian underscored that he shares Armenians’ pain first, “because of the genocide our nation was subjected to and second, for the policy of unconcern manifested toward that despicable crime.” He said that he and a number of progressive Jewish intellectuals are fighting against such policies. According to Auron, the Jews must be the first to recognize the Armenian Genocide. He noted that in recent years, there has been a considerable change of attitude in his country’s civil society and expressed hope that it will also influence the current policies. In his book, historian Auron has documented the situation of the two ethnic minorities – the Armenians and the Jews, in the Ottoman Empire at the beginning of the 20th century, political forces, a complicated balance of morals and pragmatism, and analyzed the attitude of the Jewish community of Palestine and leaders of the Zionist movement toward the Armenian Genocide.